When I wrote about hantaran agar-agar kering for my niece in 2008, many people commented and asked for the same type of agar-agar. 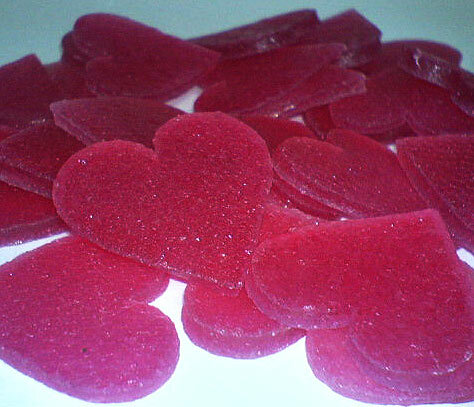 Please be informed that the supplier is no longer making that rose agar-agar kering. 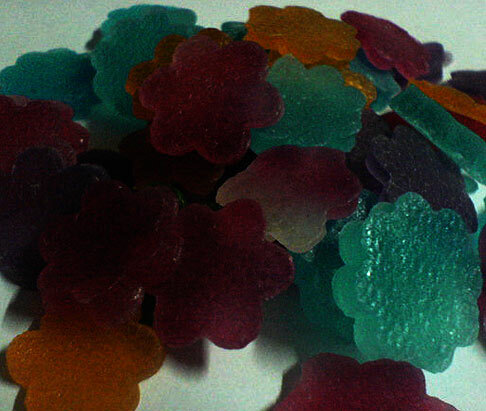 However through blogging, I found another person based in Bukit Mertajam who makes agar-agar kering for wedding favors. 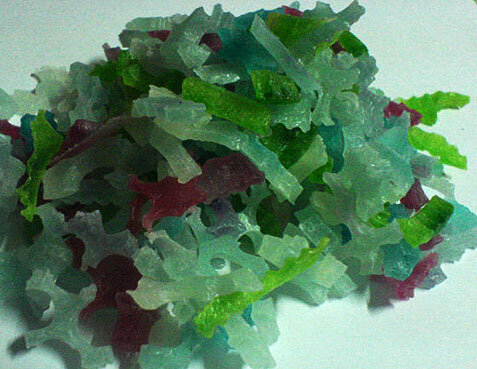 These are some of the pictures of agar-agar kering she makes. If you are interested, please contact her directly at her blog – AdamShoppe. I’m thinking of ordering some for Hari Raya this year. I have not eaten such delicacy for ages. No one makes kuih muih lama during Hari Raya open house anymore. 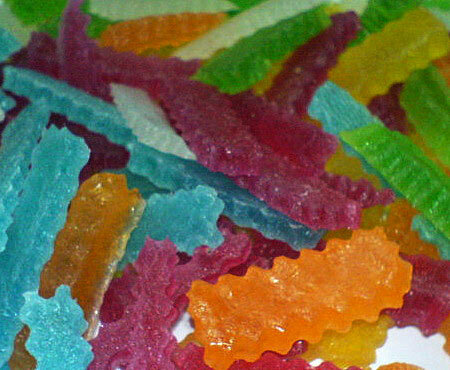 I am not sure whether she can make agar-agar kering in rose shapes. Will have to ask her one of these days. I’m sure if she can make it, it would be a great idea for gubahan hantaran. The picture is not doing any justice to the bunga dip sample I made a few days ago. I am trying to save the whole bottle of dip hitam I bought in January. 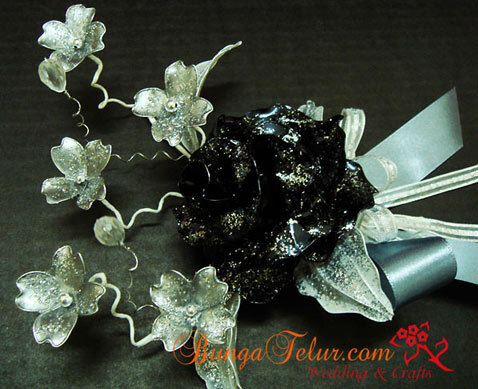 Since I have tried red and black combination earlier, I thought this time I will do black, silver and white combination for this bunga dulang mini. For the rose, I tried making the petals curvy by pinching the wire before dipping into the dip solution. I think I prefer the simpler style I taught in class. For the glitter effect, I used silver glitter instead of the usual rainbow dust. Not really the best sample, but after a long time not experimenting with new creation, this should be a good start. It has been more than 6 weeks since I last wrote about the crackle and decoupage project. The bottle which is originally a Tazo Tea with peach flavor has been mailed to the recipient before the dateline of the Gift Exchange. I hope she likes what I’ve done with it. I applied Jo Sonja Opal Dust on the peach and leaves motifs, I might have overdo it as you can see the big pearly, greenish dots on the motif in the picture above. As always the picture didn’t do any justice. I prefer viewing the real bottle. 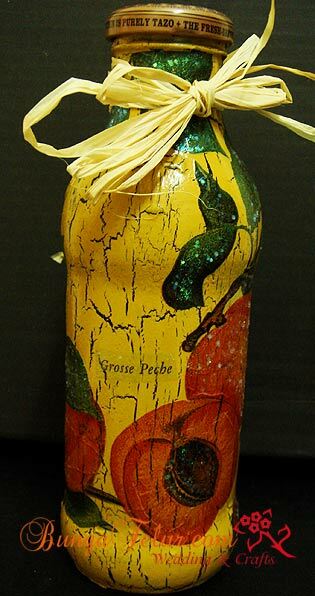 I have another bottle but with white background, thus the crackle effect is not really prominent. Still thinking whether I should repaint that bottle.